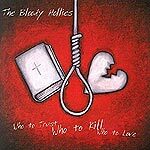 CD review: "Who to Trust, Who to Kill, Who to Love"
Raw, three-chord rock 'n' roll combining metal, glam and punk, San Diego's The Bloody Hollies' sound is equal parts T-Rex and Guns N' Roses on their new album. The third outing from the Buffalo, N.Y., transplants is full of the kind of youthful buzz that has always marked the best rock. A high-energy mix of twin guitars and drums behind Wesley Doyle's snarling yet urgent vocals, the music on "Who to Trust, Who to Kill, Who to Love" is a beguiling blend of attitude and musicianship. If the lyrics can be a bit silly at times in their eager pursuit of nastiness ("Cuz I was born for evil/Evil's all I've done"), the band's assertive, confident playing provides the sort of backdrop that makes them work (see the Guns N' Roses reference above). Too, the songs themselves are catchy enough that the lyrics don't need to be Dylanesque in order to hold your attention. It's that part that makes the music of the Bloody Hollies stand out: There is no shortage of rock-star wannabes who have the hair, dress and mannerisms down pat; there are very few, though, who provide the combination of good songs, talent and confidence these guys do.